If your heart lies away from the city and you feel more at home with the sights, sounds and smells of the natural world, Country Living is the antidote you are looking for. 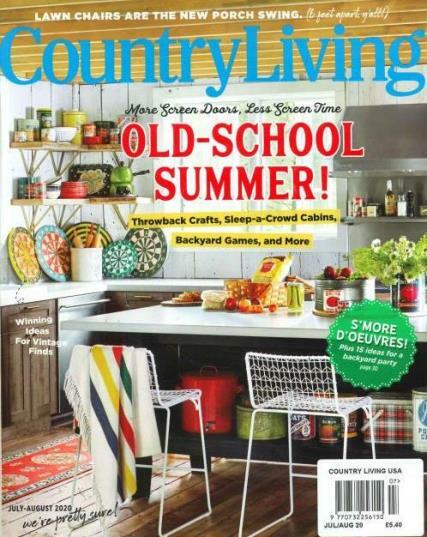 Buy a single copy or subscription to Country Living magazine. When you subscribe to this magazine with Unique magazines you receive the following benefits. With every order get a 20% discount code for www.cardsfromunique.co.uk and save on your Greetings Cards. Containing a wealth of ideas for your home and garden – be it crafts, cooking, seasonal produce or anything that satisfies the country-lover’s soul – It has it all. Billed as a comprehensive magazine, it is the first port of call for readers looking to keep abreast of rural affairs. It is filled with insightful articles on British farming, features on the most popular crafts and tips on anything from recycling to landscaping your home. A subscription is also a fantastic source of information on upcoming county shows, festivals and exhibitions to make sure that readers don’t miss out on the best Britain’s rural communities have to offer. You don’t have to live out in the sticks to enjoy spending your downtime in the countryside. There are plenty of city dwellers who like nothing better than getting away from it all on a weekend – guided by the information and advice they get from buying this magazine. Seems many more pages of adverts than there used to be, but still enjoyable features, even if their idea of rural life differs greatly from my reality - a distinct lack of mud! Being a country girl at heart, but trapped in Greater London, it's nice to open up pages to a colourful and lovely world. I look forward to getting this mag every month as it opens a window to a much prettier world than that in which I live (grey, grey and more grey!). Home is always home, and for those of us living abroad it's delightful to spend some time lost in the pages of this well put together magazine. Plenty of good ideas for the home, recipes and snippets of info of life in the UK. LOVE IT! Great mag, always been a favourite with all family members.